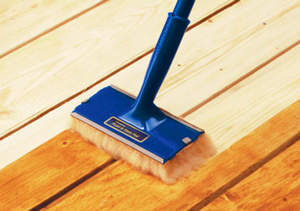 If your deck was previously sealed you will need to clean / restore and or remove the product currently on your deck. You will need to determine what type of product was used previously on your deck. 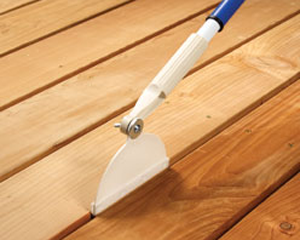 If the product was an acrylic based product you will have to sand the product off the deck. 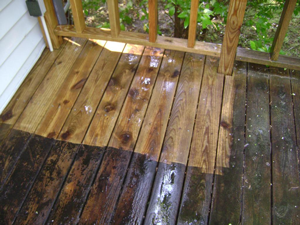 Otherwise you can use a cleaner stripper such as, Clean & Brite TWP Restore Deck Products to remove the old material with a power washer. Choose your TWP Stain. You can use our online product wizard or go directly to the stain pages to choose your color. 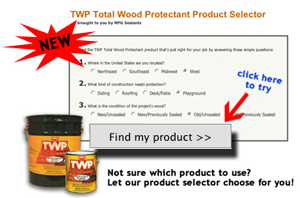 Click here for TWP Stain. Mix well using a drill mixer and continue to mix every 15 minutes. Place a drop cloth or cardboard under the edge for dripping. Use a garden sprayer (available from your local paint store) or paint pad apply starting with the rails - work up and down if using a paint pad. If using a sprayer do one section at a time and then go back with a paint pad or brush to feather out the drips. Use a crack and groove tool to apply the stain to the cracks between the boards. You should only apply a second coat if doing it wet on wet. Homeowners should only apply 1 coat liberally - if you are not experienced it will show where you stop and start applying the stain. If there is any puddling you should wipe this off within thirty minutes to avoid tracking. The surface should be safe to walk on by the next day. Have Questions? Fill out the form below and a member of our staff with respond to you shortly.